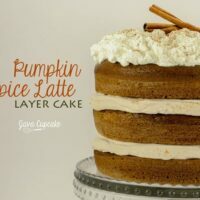 Three layers of rich pumpkin and espresso cake filled with espresso cream cheese frosting and topped with cinnamon nutmeg whipped cream make this decadent Pumpkin Spice Latte Layer Cake the perfect Fall cake! Finally, Starbucks has brought the Pumpkin Spice Latte to Deutschland! After years and years of success in the USA… the coffee company finally came to their senses and is not serving the super popular Fall drink in stores around the world now! I’ve lived in Germany for almost three years now and each Fall season, I’ve been so sad to have to go with out my PSL. BUT… not this year! YAY! Rachel and I made a special trip to Nurnberg just to get a PSL (and so some shopping). It was soooo worth the hours drive! 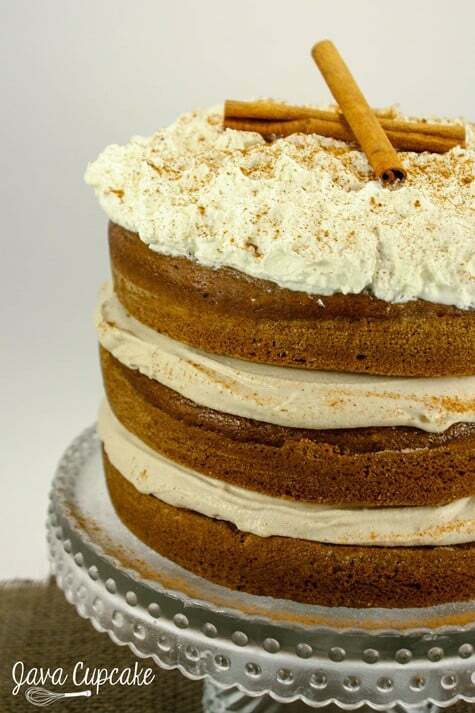 This cake is my dedication to the Starbucks drink I love so much… layer upon layer of pumpkin spice latte cake filled with espresso cream then topped with a mound of fresh whipped cream garnished with ground cinnamon and nutmeg and fresh cinnamon sticks! I could not believe how incredibly moist the cake was and how well the espresso cream paired with the flavors of the cake. Not one over-powered the other and they worked in perfect harmony with one another. Next was a bite of the whipped cream on top with cake and espresso cream. The slightly sweet whipped cream was perfect… seriously perfect. One person told me it tasted like eating your favorite pumpkin pie while drinking a chai tea latte. Spices, pumpkin and coffee. Pure perfection. This cake is definitely on my MUST BAKE LIST for every Fall season… and maybe again this year! Each bite of this cake was a delicious reminder of why I love Fall… and why I love Starbucks! YUM! 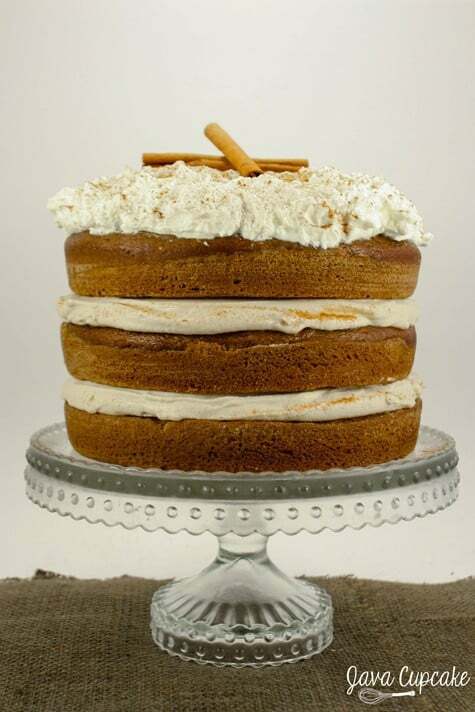 Inspired by the Pumpkin Spice Latte from Starbucks this cake is three layers of pumpkin spice latte cake filled with espresso cream and topped with fresh whipped cream, cinnamon and nutmeg! Delish! Preheat oven to 350 F degrees. Grease 3 8-inch round pans then line them with parchment paper and grease again. Flour the pans. In a medium bowl, sift together the flour, baking soda, baking powder, espresso powder, cinnamon, nutmeg, allspice, cloves, ginger and salt. Set aside. In the bowl of your stand mixer, combine the sugars until no more clumps remain. Pour in the oil and mix until incorporated. Add the eggs one at a time. Mix well after each addition, scraping the sides and bottom of the bowl also. Mix in the pumpkin puree and vanilla extra until smooth. With the mixer on low speed, add the flour mixture in three parts mixing until just combined before adding more. Turn the mixer off when almost all of the flour has been incorporated. Add the hot coffee and mix with a spatula just until the batter is smooth. DO NOT OVER MIX! Pour 2 1/2 cups of batter into each prepared pan and place on the center rack in the oven. Allow to cool in pans for 5 minutes before removing to a wire rack to cool completely. In a small sauce pan, whisk together the heavy cream and espresso powder over medium-low heat until all the espresso has dissolved and the mixture is warm. Remove from heat, transfer to a bowl and refrigerate until cold. Once the cream is cold, in the bowl of a stand mixture fitted with the whisk attachment, mix together the cream cheese and butter until smooth. Add the powdered sugar, vanilla and salt and mix until incorporated. Scrape the bowl to ensure all the sugar has been mixed in. Pour in the cold cream and whip for about 20 seconds. Scrape the bowl and whip again for about 1 minute or until the mixture thickens. DO NOT OVER MIX or it will turn to soup. Refrigerate for at least 1 hour or until ready to use. Store any leftovers for up to a week in an airtight container in the refrigerator. In the bowl of a stand mixer with the whisk attachment, whip the heavy cream on high. Slowly add the granulated sugar in 8-10 small portions. Add the vanilla extract. Continue to whip until stiff peaks form. Place one layer of cake on your serving stand/tray/plate. Spread a 1/4-1/2 inch layer of espresso cream over the top of the cake. Place the second layer of cake on top of the espresso cream. Spread another 1/4-1/2 inch layer of espresso cream on top of the second layer. Place the last layer of cake on top. Dollop the fresh whipped cream across the top of the cake in an even layer. Sprinkle with cinnamon and nutmeg and garnish with two cinnamon sticks. Oh YES please. This is fall deliciousness in a dessert! I love my PSLs! Cake itself was very good but filling was too runny. Patricia – I’m glad you enjoyed the cake. About the filling – yes it is a very soft filling, but if you chill it before you fill the cake and then keep the cake chilled until 15 minutes before serving, it stays set. The creaminess really adds to the overall texture of the cake! What do you think about maybe stabilizing and whipping the cream separately and then folding it in? 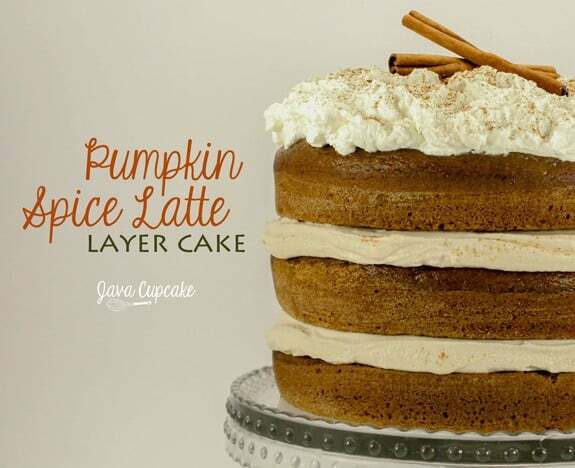 Hi, considering making this cake for a Thanksgiving day Potluck, but I don’t have Starbucks where I live. Can I substitute the PS flavored coffee with something else? thanks! Sure! Just used any coffee you have. Maybe add a tad more cinnamon and nutmeg to the batter. Happy Baking! And let me know how it turns out for your potluck!! It’s a HUGE cake so lots will enjoy it!